Jane Jacobs Google Doodle from May 4, 2016. Check out the backstory here! 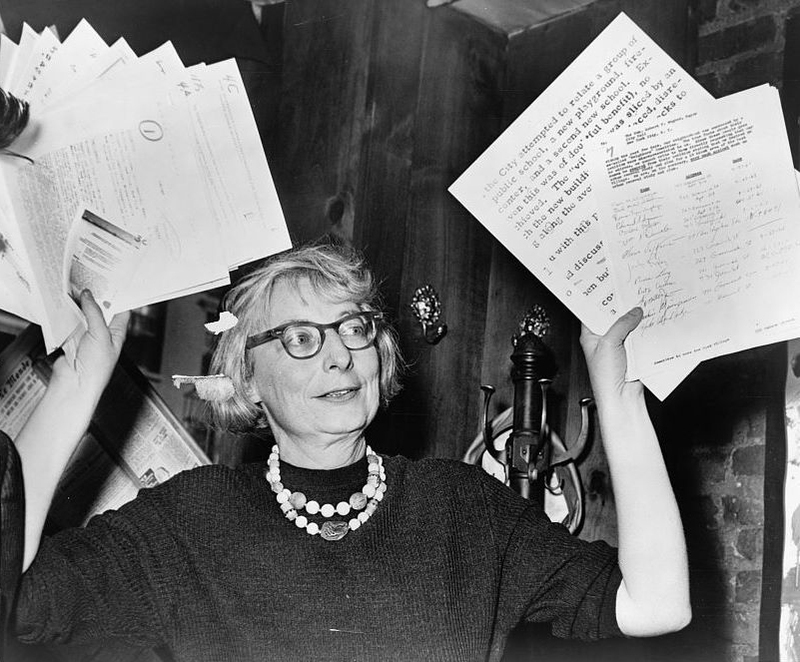 Earlier this month, in celebration of what would have been the 100th birthday of Jane Jacobs, people and organizations took to the web to glorify (and sometimes lament) the legacy this great urban thinker. Google even got in on the fun. Jacobs added so many great ideas to our understanding of places and cities, and on occasions like these, it’s so tempting to reduce them to their most shareable form, to make idols, caricatures, and strawmen of her arguments. So while PPS believes strongly in spreading her insights as broadly as possible, we would like to echo a very Jacobsian caveat offered by Peter Laurence, author of Becoming Jane Jacobs, about the many uses, abuse, and criticisms of Jane Jacobs out there this month: These articles are no substitute for reading her books and making up your own mind. A collection of Jacobs tributes, in both word and image, curated by Curbed. 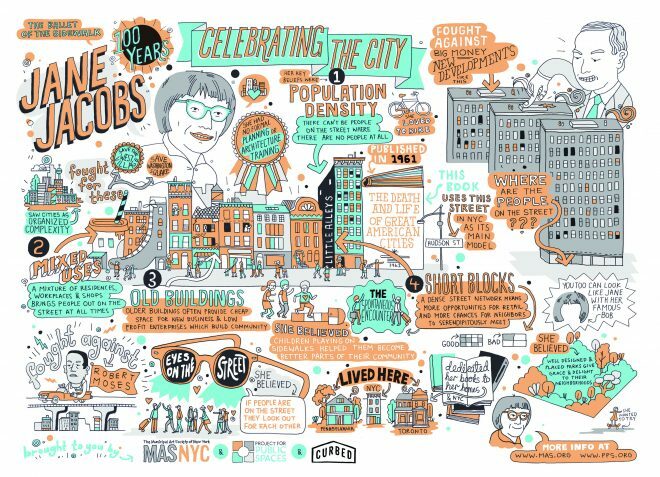 In honor of Jane Jacobs's 100th birthday, artist James Gulliver Hancock created this illustration of Jacobs' principles, commissioned by Curbed, the Municipal Art Society, and Project for Public Spaces. In The Guardian, economist Saskia Sassen recalls her first meeting with Jane Jacobs in the early 1990s, and asks which patterns and processes Jacobs would challenge us to see in today’s cities and urban economies. In The Globe and Mail, Jane Jacobs’ son Jim Jacobs shares some childhood memories while discussing “Jane at Home”—a week-long exhibition of photographs and personal items, which he co-curated and which took place at Urbanspace Gallery in Toronto—including an unexpected cameo from Bob Dylan. 4. Must We Sacrifice Community Control for Better Places? At PPS, we believe that community control and better design are a false dichotomy. Our current adversarial system gives communities the choice of NIMBYism or nothing. With the right tools, communities can be the drivers of progressive change. Although best known for her first two books, The Death and Life of Great American Cities and The Economy of Cities, Jane Jacobs wrote many more up until her death in 2006. Both Peter Laurence and Richard Florida took the opportunity of her 100th birthday to examine the warnings in her final book, Dark Age Ahead. Although Jacobs was wary of predictions, she often made observations about the present that few others saw, which made her look like a seer in retrospect. For instance, when few were questioning the ever-growing bubble of the housing market, Jacobs already saw the inklings of the 2008 crash in Dark Age Ahead. Although imperfect, her final book is full of such cautions about our current times, as well as a healthy dose of hopeful new departures.